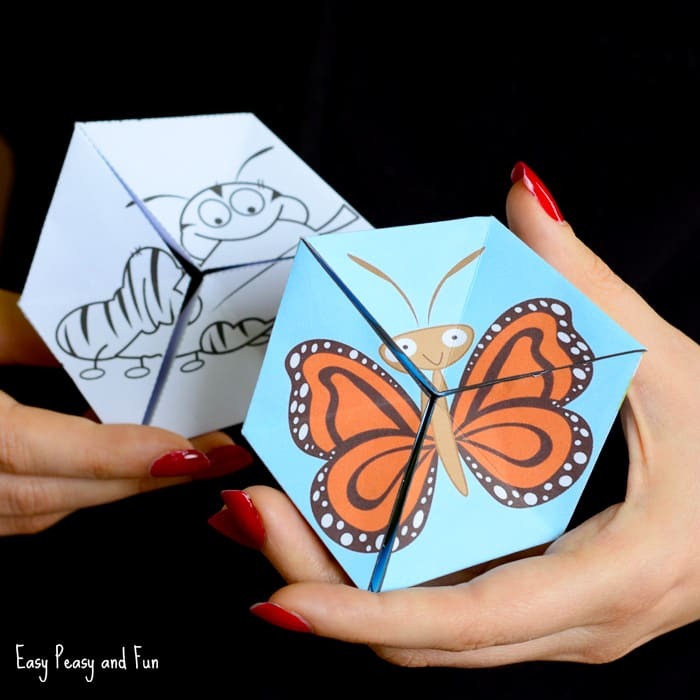 Let’s learn about the life cycle of a butterfly with this engaging butterfly life cycle paper toy flextangle. 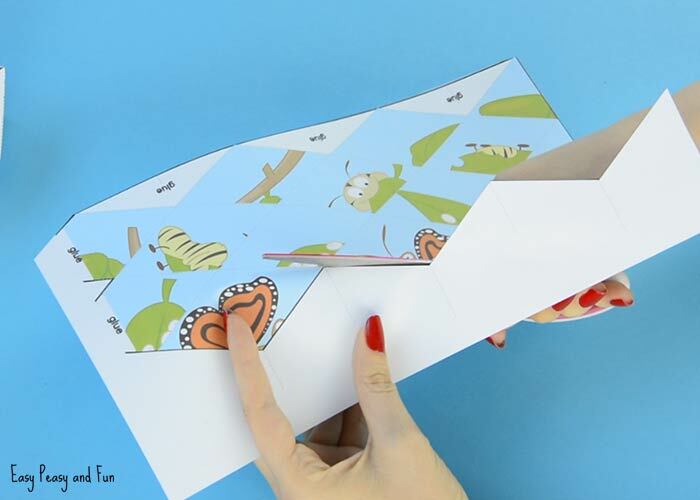 This paper craft template covers 4 stages of the cycle – the butterfly, eggs, caterpillar and cocoon. 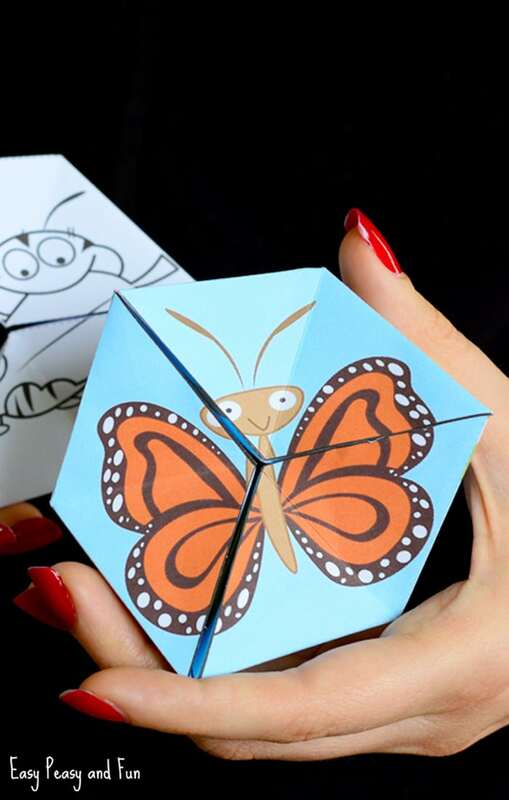 So print the template, follow the step by step folding instructions and have fun! 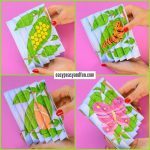 If you have a chance to learn about the life cycle of a butterfly by observing it in nature that is one of the best ways to learn about it. 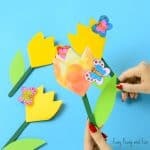 But if that isn’t an option, or if you just want a butterfly life cycle craft that’s kind of fun and kids can take at home – this butterfly life cycle paper toy flextabngle is the thing to make. 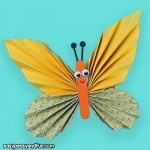 This one is the first in our life cycle craft series and I can’t wait to make more of them (both paper toys and regular crafts kids can make). 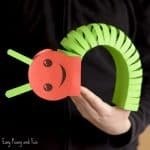 Flextangles are one of the most fun paper toys out there as you can turn them around indefinitely – which is kind of perfect for teaching life cycles. Folding them? It might look hard but they really are easy peasy! Ready to make your own? 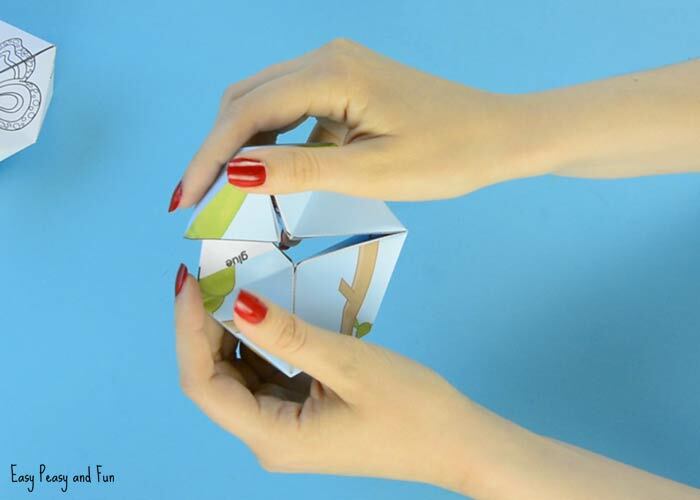 Grab our paper toy template and get folding! Start by printing our template. If you printed the black and white one, this is the time to color it. Cut out the template along the black outline. 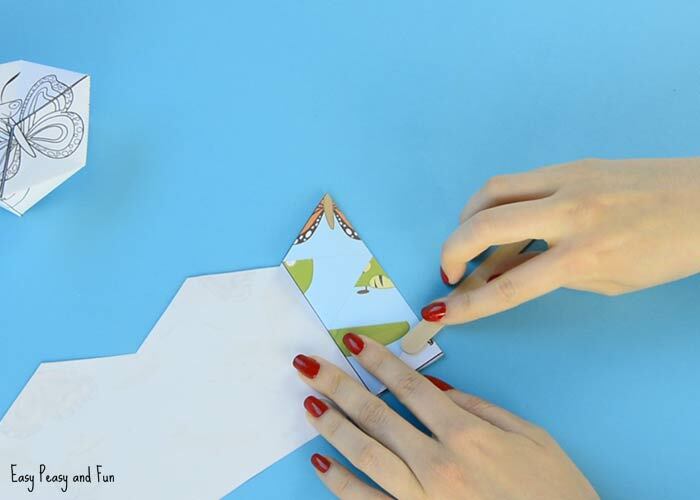 You will see the two flaps at one side don’t have a black line – it’s best to cut in the direction of the line to the edge of the paper. Now comes quite a lot of folding and scoring. It is super important you score the folds as this will make the craft easy (if you don’t score them, they will be hard to nicely put in place). We just used a craft stick and it worked out nicely. First fold along all the verticals (these are marked on the template, but are marked outside the actual paper toy). Now fold along all the dashed diagonal lines. Now comes the part that might seem a bit tricky but it really is not! 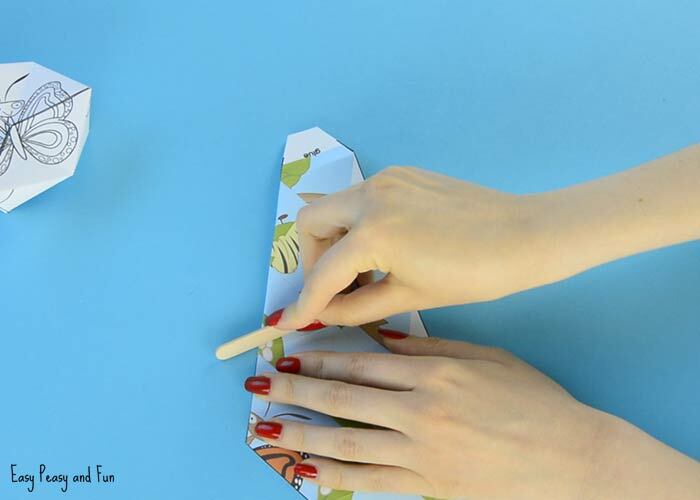 “Roll” the template into a tube – just to get the feel of it. You’ll see a few white triangle that have the word glue on it. Apply glue there (start by just applying the glue to one). Now roll it into a tube again, pressing the triangle with a pattern that is on the opposite side of the tube on top of the white triangle with glue. I know, I know it sounds confusing but when you actually make it it makes perfect sense (you can always watch the video to see how we did it). Continue with the next pair of triangles. And the last one. You’ll see two flaps one one side and a thin opening on the other side of the tube. 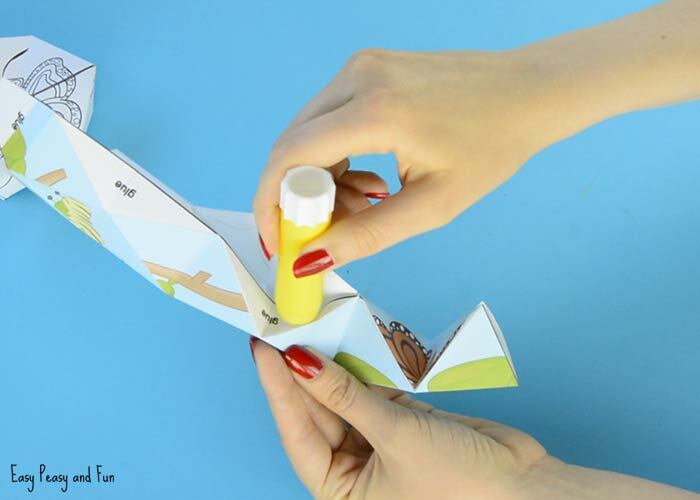 Apply glue on the flaps (there’s that word glue again) and push the flaps into the opening. Press gently for the glue to set. Now leave it alone for just a short while for the glue to do it’s glue magic and then you are ready to roll! 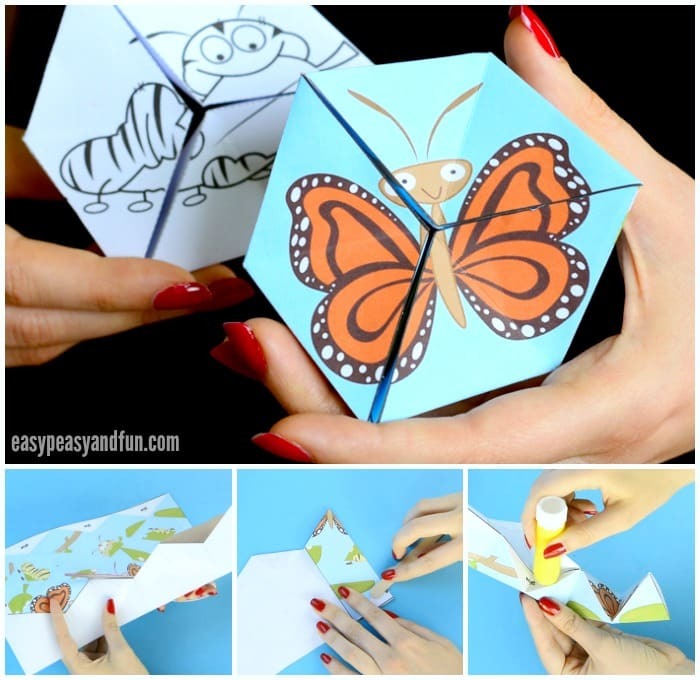 Your Butterfly Life Cycle Paper Toy flextangle will be able to roll and roll and roll. The first few twists might be a bit slow, but once all falls into place things will get smoother. Clicking the link bellow will open the template. Alternatively you can hover your mouse over the links, right click and choose save as to save the template to your computer. 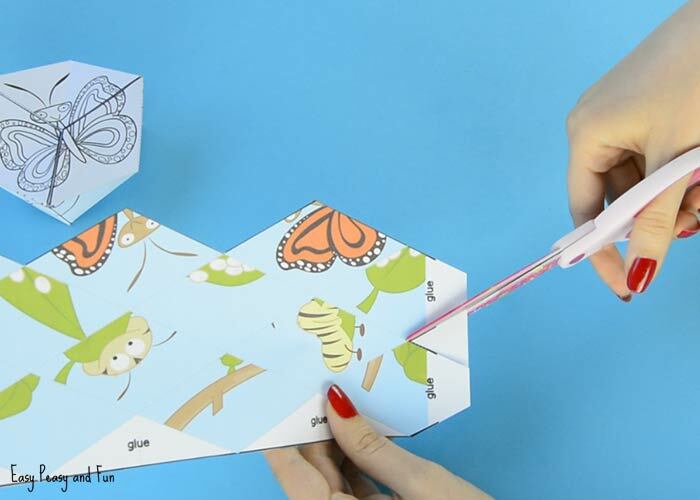 The butterfly life cycle paper toy is just clever! 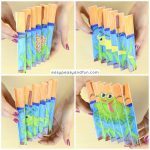 This was a really cute and fun craft! I like pom pom craft. WOW! Looking at it, I could not figure out how to make it! I was glad for the video! Thank you! Never mind I got it. So excited to use it with my kids. Thank you so much! I teach middle school academics in a center school. I think this is cute and a great teaching tool. 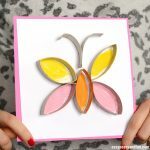 I am unable to download this template, like I have done on the other crafts. Is it no longer available? I wanted to do this with my granddaughter, she loves butterflies. I was able to print it after I wrote. Thank you so much for a very unique craft. This is a great idea. I am not able to get the template though. Is it still available? It worked after I commented as well. Thank You! This looks amazing, but I can’t find the template download link 🙁 am I having a ‘tired’ not very good look? apologies in advance if I am. Got it! Thank you! the mind boggles in the skill in art and engineering you have. thank you again! This is awesome! Any plans to make one for the frog life cycle?!?!?! ?